Are you someone who often travels internationally? If so T-Mobile is announcing a new plan that may be of interest to you. Priced at just $5 a day, its users will get Unlimited calls and texts along with 512MB of 4G LTE data. T-Mobile customers will be able to but a total of two international passes over the course of 24 hours. The international pass covers the countries that are included in T-Mobile's Simple Global list, which is set to expand to over 200 locations beginning July 22. If you are a T-Mobile ONE subscriber, who has unlimited talk, unlimited text and unlimited 2G data, this plan gives you a way to upgrade to LTE data when you are traveling abroad. The daily price is half of what AT&T and Verizon charger their customers for out of country use. 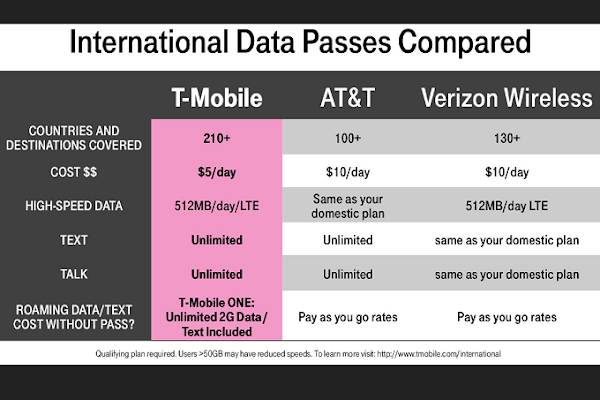 The new International Data Pass will be available for T-Mobile customers starting August 1st. A Simple Global package with T-Mobile will include picture messaging, visual voicemail and one hour of in-flight Wi-Fi through GoGo (where available). If you are someone who travels out of the country often, you may want to consider a T-Mobile Simple Global plan, which is available though a T-Mobile ONE subcription.